Copycat chicken recipes that are better than the originals are the focus of today’s post. Chicken is a protein staple of many of our diets. These days and you want to keep your dishes from being boring. Most of us have at least one favorite restaurant chicken meal (hello Chick-Fil-A!). For those times when you can’t go and order it, there’s always the option of making it at home. Luckily, creative food bloggers have come up with amazing copycat chicken recipes here. Some are from the most popular restaurants and chances are you’ll find some dishes you love in our picks! If you have an instant pot you might like THESE hearty recipes as well. 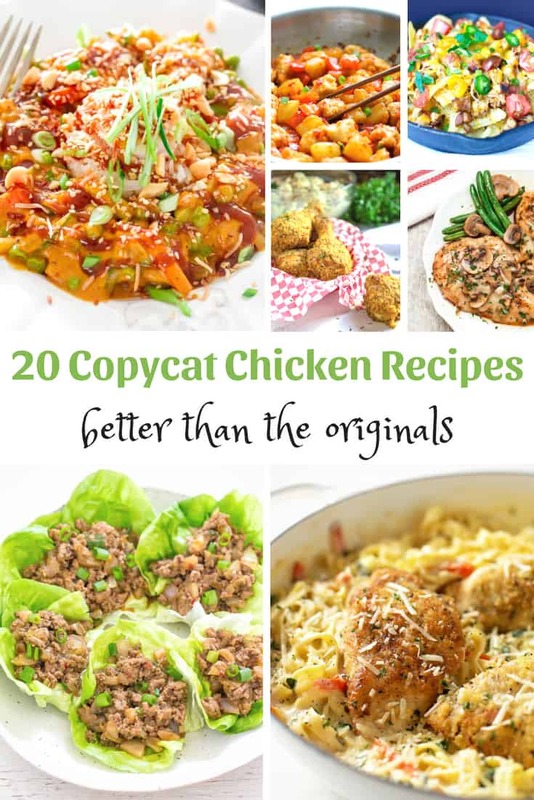 Here are some of the best copycat chicken recipes, some that are even more yummy than the originals. We’re featuring Olive Garden, Panda Express, Cheesecake Factory, PF Chang’s, Chili’s, KFC, The Cheesecake Factory and other well-known restaurants. All of them will surely be a hit in your family. Have you tried making any copycat recipes at home and do you have a favorite? It is always fun to remake something you have tried at a restaurant and everyone just loves. Sometimes they do come out tasting even better. Must be the fresh ingredients we are using. I always liked the Oriental Chicken Salad from Applebees. I rarely eat there these days but I’d love to make the copycat recipe. I see several chicken recipes I’d love to try. Hi Janet! These all look and sound so good! I love the Applebees Oriental chicken salad and have made this for my daughter. It is so yummy! It also makes you feel like you are being healthy too. I definitely will be trying some of these recipes. Thanks so much for sharing! Yum, I need to try these out for sure. I love many of these dishes from the restaurants you listed. I am hungry now. I love a good copycat recipe. Looking forward to giving some of these a try. Would love to try the panda express orange chicken. No shortage of meal ideas there! That’s a nice list, particularly for those that eat out in restaurants often and have favorites. I love copycat meals. Typically they taste better and they’re much better for you because you know what’s in them. I will have to pin this post and try out a few of the recipes. This is such a great compilation of chicken recipes! The first one I am going to try is the Cheesecake Factory Bang Bang chicken, we love that one. I would have a hard time passing up some KFC fried chicken! I know it’s not good for me, but, you know, it’s finger licking good! If I could even come close, that recipe would be dangerous. I love, love, love the fact that you have PF Chang’s Lettuce Wraps in there. I love ordering those when we visit the restaurant so it would be awesome to make them at home. I am all about recreating stuff and trying out copy cat recipes. I feel like sometimes we are simply overpaying for the brand or name of the product. I cant wait to try this. So many great recipes to try out. I guess I will make sure to try first the P.F. Chang’s Chicken Lettuce Wraps and the one from Applebee’s Oriental Chicken Salad. That chicken lettuce wrap is speaking to me. When I am cooking, I hardly ever follow an original recipe, I always tweak it to my own liking. I am always looking for new recipes to try. These look and sound great. I’ll be trying them out soon. I love a good copycat recipe. Definitely going to be checking these out! OH wow! These all look amazing! I need to make some of these with the chicken I have defrosted! I have been trying to lose weight and t get my husband to check out Weight Watchers with me. Although it hasn’t happened yet, I am trying to get more healthier so the child recipes you shared with us will help me stay on track.